^ "Lionel of Antwerp, duke of Clarence | English noble". Encyclopedia Britannica. Retrieved 24 January 2018. ^ Maskel, J. (21 June 1890). "The Dukedom of Clarence". Notes and Queries. 7. London, UK: Oxford University Press. 9 (234): 481–483. ISSN 0029-3970. OCLC 2623018. Retrieved 21 February 2016. Edmund of Langley, 1st Duke of York, KG was the fourth surviving son of King Edward III of England and Philippa of Hainault. Like many medieval English princes, Edmund gained his nickname from his birthplace: Kings Langley Palace in Hertfordshire. He was the founder of the House of York, but it was through the marriage of his younger son, Richard of Conisburgh, 3rd Earl of Cambridge, to Anne de Mortimer, great-granddaughter of Edmund's elder brother Lionel of Antwerp, 1st Duke of Clarence, that the House of York made its claim to the English throne in the Wars of the Roses. The other party in the Wars of the Roses, the incumbent House of Lancaster, was formed from descendants of Edmund's elder brother John of Gaunt, 1st Duke of Lancaster, Edward III's third son. Duke of Clarence is a substantive title which has been traditionally awarded to junior members of the British royal family. All three creations were in the Peerage of England. Philippa of Clarence was the suo jure Countess of Ulster. 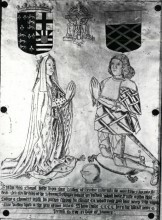 Edmund de Mortimer, 3rd Earl of March and jure uxoris Earl of Ulster was son of Roger Mortimer, 2nd Earl of March, by his wife Philippa, daughter of William Montagu, 1st Earl of Salisbury and Catherine Grandison. Roger de Mortimer, 4th Earl of March was an English nobleman. He was considered the heir presumptive to his cousin King Richard II. The title of Earl of Ulster has been created six times in the Peerage of Ireland and twice Peerage of the United Kingdom. Since 1928, the title has been held by the Duke of Gloucester and is used as a courtesy title by the Duke's eldest son, currently Alexander Windsor, Earl of Ulster. Ulster, one of the four traditional provinces of Ireland, consists of nine counties, six of which make up Northern Ireland, the remainder are in Ireland. 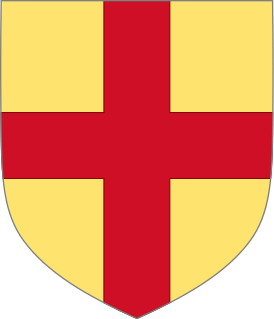 The House of Burke is the Irish branch of the Anglo-Norman noble family known as de Burgh. Elizabeth de Burgh, Duchess of Clarence, suo jure 4th Countess of Ulster and 5th Baroness of Connaught was a Norman-Irish noblewoman who married Lionel of Antwerp, 1st Duke of Clarence. Established in 1248, Clare Priory is a religious house in England. It is situated on the banks of the River Stour, Suffolk, a short distance away from the medieval village of Clare. It was the first house of the Augustinian Friars in England. The house passed through many hands until it was again purchased by the Augustinian friars in 1953. Today the Priory offers modern retreat facilities for guests. Anne of York, Duchess of Exeter, aka Anne Plantagenet, was the first child of Richard Plantagenet, 3rd Duke of York, and Cecily Neville. She was thus the eldest sister of kings Edward IV (1461–1483) and Richard III (1483–1485); and of Edmund, Earl of Rutland, Elizabeth of York, Duchess of Suffolk, Margaret, Duchess of Burgundy and of George Plantagenet, 1st Duke of Clarence. Violante (Jolantha) Visconti was the second of three children of Galeazzo II Visconti, Lord of Milan and Pavia, and Bianca of Savoy. Her father gave to her the provinces of Alba, Mondovì, Kenites, Cherasco, and Demonte as an inheritance.